With each deliberate stroke of the piano keys Roisin Adams builds an entrancing aura that permeates the auditorium. Like any instrumentalist, Adams is still a storyteller, but in the absence of words, she must find a way to maintain the audience’s interest and evoke emotion. That’s the challenge, she says, making instrumental music accessible to people. “Without lyrics sometimes you lose a percentage of listeners,” explains Adams. Her inventive compositions, which often employ an improvisational free-form jazz technique, transport the audience to Adams’s ethereal world where imagination runs free. Adding to the illusion is the mystical name adopted by the jazz ensemble, Hildegard’s Ghost, that Adams belongs to. Hildegard’s Ghost joins a curated lineup of talented musicians performing at this year’s Jazz Waves series currently underway at the Silk Purse Arts Centre in West Vancouver. For Adams, a North Vancouver native and lifelong musician, the Jazz Waves event is a chance to showcase her craft close to home – and she couldn’t be more grateful. “I’m honoured to be on a bill with a lot of legends,” said Adams, speaking to the North Shore News after a rehearsal with her ensemble last Friday. Now almost 30 years old, Adams’s innate musical ability can be traced back to her childhood roots in Blueridge. The revered piano teacher instilled in Adams a good theoretical understanding of music, which helped carry her through musical composition classes at Windsor secondary and later at Vancouver Community College. As for why she gravitated towards the jazz genre, Adam’s couldn’t help but be mesmerized by the music of a certain jazz great. “It’s because of Louie Armstrong, to tell you the truth,” reveals Adams, adding she still has a big heart for early jazz influencers including Fats Waller and Scott Joplin. Adams’s path to professional music making included a stop at UBC where she studied religious philosophy, and psychology. After she graduated Adams discovered a piece of her past that changed the trajectory of her career path. “One day I found the trumpet that was in my closet from high school and I was like, ‘Oh, this thing,'” recalls Adams. She soon joined The Carnival Band, a community marching ensemble and orchestra that has become a Commercial Drive fixture. While thoroughly enjoying that experience Adams made the decision to study contemporary jazz and keyboard music at VCC, where she wound up meeting fellow musician Justin Devries. Hildegard’s Ghost was born in 2013 out of a VCC music program competition for the best contemporary composition. 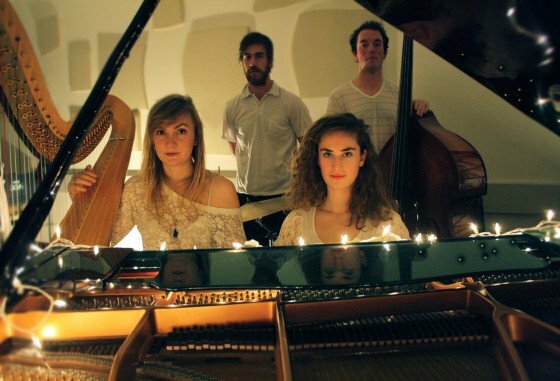 Adams formed the ensemble along with Devries, a drummer, and Elisa Thorn, who plays the harp. Adams subconsciously stumbled upon the name for the group during her first week of music history class. She was enraptured by Saint Hildegard of Bingen – a celebrated German composer and theologian who lived during the Middle Ages. “She (Hildegard) was a strong woman in every sense of the word. Her music is just amazing. It just clears out your mind. It enables all meditation. It was just kind of a tip of the hat to her (to name the band after Hildegard). But I don’t know how she would feel about us calling her a ghost,” says Adams with a laugh. Hildegard was perhaps watching over the newly formed ensemble when they scored top honours, along with some free recording time, in the VCC music competition. Adams channels Hildergard’s ethereal approach to music, while adding a unique flavour to her compositions that is sometimes achieved through improvisation. For example, take the song “Some Things are Timeless” from Hildergard’s Ghost’s debut album Stories. The use of haphazardly placed staccato high notes interspersed into moody melodies conjures up images of an abandoned, rundown carnival. “The music itself is pretty dark and reflective,” describes Adams. In the creative music video for “Some Things are Timeless,” two puppets are seen ambling around in a post-apocalyptic environment, just trying to survive – a metaphor for the current state of affairs in the world today, explains Adams. “I think we are all feeling anxious in our minds where things are going with global warming and the earth reaching its limits,” she says. Neophytes on the Vancouver music scene, Hildergard’s Ghost (hildegardsghost.com) is gaining as much exposure as possible. They recently performed at the Sonic Boom Festival, a multi-day celebration of new music by B.C. composers. Hildergard’s Ghost’s next goal is to nail down a permanent bass player for the band. For the Silk Purse show, bassist James Meger will join them. “He’s really phenomenal for improvisation,” describes Adams. Hildegard’s Ghost will perform lush and unique improvisational free-form jazz music on June 13 as part of the Jazz Waves series. From now until July 25 jazz enthusiasts can catch a stellar line-up of musicians playing everything from RB to gospel, to blues and Latin jazz, in an intimate venue on the Ambleside waterfront that boasts spectacular views of the ocean. Multi-instrumentalist Don Hardy with the Guilty Pleasures will entertain with a night of rockin’ blues music on June 20. West Van virtuoso Amanda Wood on July 23 returns to the Silk Purse to perform songs made famous by British artists from the 1960s to present day. Jazz Waves wraps up on Saturday, July 25 with a rousing performance from the 2014 Western Canadian Music Award-winning gospel singers The Sojourners.